I’ve upped my exercise level this month, incorporating running with synergy (a yoga/Pilates/martial arts blend) and Pilates. Consequently my muscles are feeling it a bit. 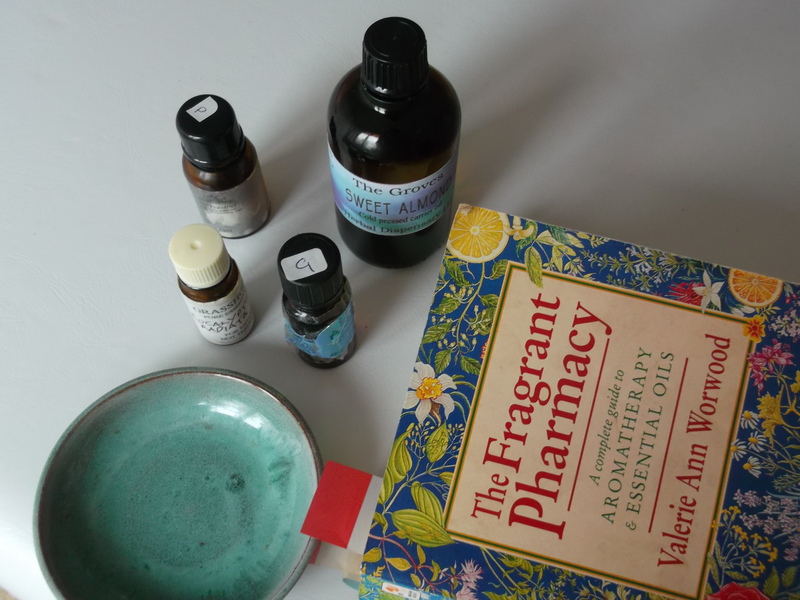 To combat this I’ve made up a massage oil based on a recipe from Valerie Ann Worwood’s The Fragrant Pharmacy. I’ve tweaked it a bit to reduce the amount of ginger, as I have an irregular heartbeat and don’t want to exacerbate it. The specific oil I’ve used is in brackets. Mix them in a small saucer and massage into to shoulders, arms and legs after a hot bath (or preferably get someone else to do it!). *If you have a nut allergy you could replace this with grapeseed. As with all essential oils, seek professional advice if you are pregnant, on any medication, or have a medical condition. Essential oils are not beauty products, they have powerful medicinal properties and should be used with care. Also, don’t be tempted to add a few extra drops to the blend. More does not equal better. The blend smells wonderfully medicinal – very important if you want your mind to be convinced it’s doing you good!! If you are wondering where to buy essential oils, then I can recommend Base Formula http://www.baseformula.com/ . I buy my carrier oil locally in Hoole, Chester from The Groves Medical Herbalist http://www.chesterherbalist.co.uk/. Incidentally The Groves also stocks Neal’s Yard aromatherapy oils which are fabulous. Does anyone else make their own aromatherapy blends?